Extending the potential applications of the time-saving Roomline range of UPVC skirting boards and architraves, Eurocell – the UK’s leading manufacturer of UPVC building components – has introduced four new designs to its existing skirting and architrave range that will complement any interior; and enable tradesman and DIYers to “toss out the timber”. 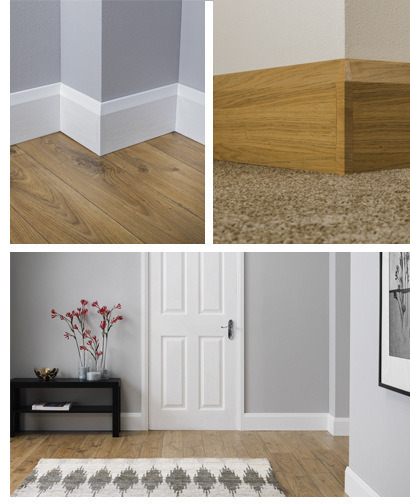 Available in two popular colours – White Satin and English Oak – the four new products are a 150mm ogee skirting; a 150mm and 100mm chamfered skirting, as well as chamfered architrave that are ideal for complementing the contemporary appearance of newer properties. Using Roomline products cuts out the sanding, cutting and painting of timber skirting boards and architraves and do not require traditional mitres. Instead, an innovative corner moulding system means only square cuts are ever required so the system takes half the time to fit compared to conventional timber products. Being UPVC, Roomline is ultra low-maintenance, impact resistant – compared to softwoods – and can make a contribution to flood resilience; not being subject to twisting, swelling, shrinking, rotting or warping following immersion. Manufactured entirely from recycled UPVC for minimal environmental impact, Roomline products are robust, durable and look like traditional products but never need painting. Built to take all the knocks and bumps that a busy home or office entails, Roomline skirting boards and architraves feature a scratch-resistant laminated finish and a webbed structure to resist impact. Roomline skirting and architrave products are guaranteed for a period of 10-years against discolouration, warping and cracking. The result is a smart appearance that needs no redecoration – just a quick wipe with household polish or a damp cloth, for stubborn marks Silversil cream cleaner keeps skirting and architraves looking bright and fresh. Using YourPad, the virtual home improvement app from Eurocell, potential customers can see a range of our products as they would look in situ. YourPad is free and available for either iPad or Android tablets online at the Apple Store or Google Play.